In May 12, 2008, South Africa was torn apart by wave of violent attacks on foreigners. 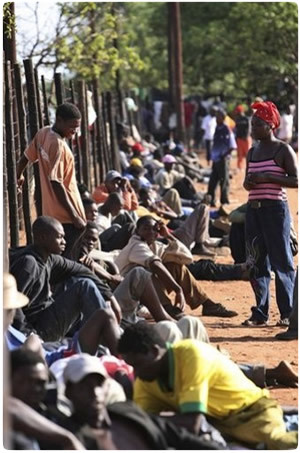 A series of riots started in the township of Alexandra (in the north-eastern part of Johannesburg) when locals attacked migrants from Mozambique, Malawi and Zimbabwe, killing two people and injuring 40 others. In the following weeks the violence spread, first to other settlements in the Gauteng, then to the coastal cities of Durban and Cape Town. SA was wracked by months of brutal incidences that included the burning of foreign owned shops, looting, mass murders and rapes. Not even children were spared. An estimated 62 people were killed by September that year. The Donaldson Trust reacted immediately and delivered blankets, nappies, infant formula milk, non-perishable items and clothes to the refugee camp in one of the worst hit areas of the East Rand; the Ramaphosa Settlement outside Springs. A second delivery of the same items was made to the Methodist Church in the Johannesburg CBD where thousands of Zimbabwean refugees had taken refuge.